' To my Lord Marquis of Carabas,' answered they altogether, for the Cat's threats had made them terribly afraid. 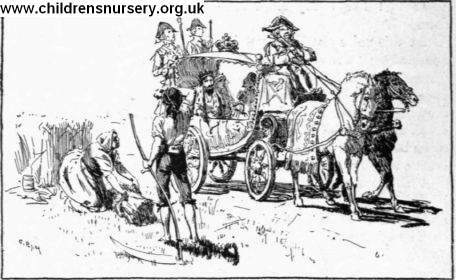 King was very well pleased with it, as well as the Marquis, whom he congratulated thereupon. The Master Cat, who went always before, said the same words to all he met, and the King was asto­nished at the vast estates of my Lord Marquis of Carabas. Monsieur Puss came at last to a stately castle, the master of which was an ogre, the richest had ever been known; for all the lands which the King had then gone over belonged to this castle. The Cat, who had taken care to inform himself who this ogre was and what he could do, asked to speak with him, saying he could not pass so near his castle without having the honour of paying his respects to him.